10 metres are water vapour (the largest greenhouse gas). We are a small boy peeing in a river, and taking credit for its increased flow. Atmospheric CO2 has risen by 100 parts per million (one part per ten thousand) over the past century. Experts claim that this one molecule has heated the other 10,000 molecules up by more than one degree centigrade. molecule would have to be 10,000°C – about twice the temperature of the surface of the Sun. The atmospheric “Greenhouse (hothouse) Effect”, is an idea that many authors trace back to the traditional works of Fourier (1824), Tyndall (1861), and Arrhenius (1896), and which is still supported in some global climatology, essentially describes a ?ctitious mechanism, in which a planetary atmosphere acts as a heat pump driven by an environment that is radiatively interacting with but radiatively equilibrated to the atmospheric system…..But according to the second law of thermodynamics, such a planetary machine can never exist. Yet politicians & hack journalists still quote it as fact !! [ Arrhenius also performed extensive theoretical research on: bacterial toxins, various plant and animal poisons, Electrochemistry, Immunochemistry & Cosmic Physics. 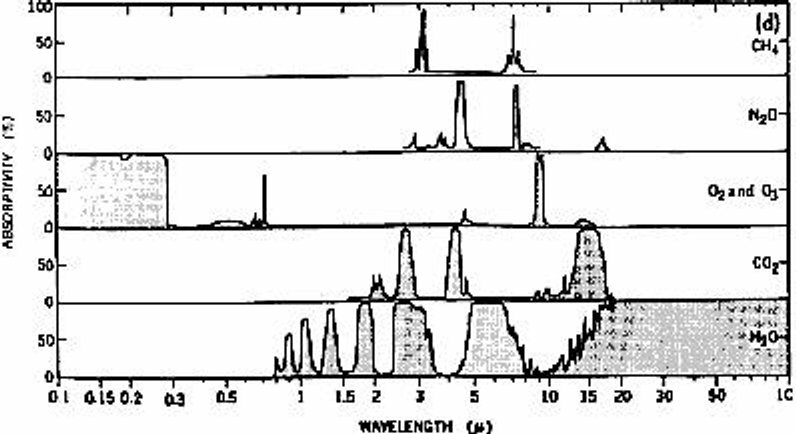 As CO2 actually has a narrow IR absorption ranges, most of the IR from the surface goes right out to space. And, the CO2 in the atmosphere is always colder than the surface – the models are daytime 24/7, no night time—the energy levels in the surface equivalent to the IR given off by CO2 are full and the IR will be reflected. CO2 cannot and does not warm the surface. CO2 is fairly well mixed in the atmosphere at ~400ppm; Water Vapour/humidity varies. 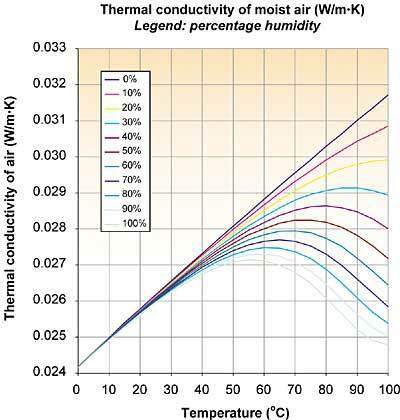 … Humidity near 0%, CO2 ~ 400ppm. … Humidity near 80%, CO2 ~ 400ppm. As CO2 levels are the same in both places, the main atmospheric variable is Water Vapour. The H20 vapour traps the heat because it interacts with energy at wavelengths (infra-red) emitted by the earth. In a solar eclipse, the air temperature can drop 10 °C in a few minutes proving the CO2 in the atmosphere doesn’t do didily-squat to stop the heat loss. If it’s cloudy you don’t see the eclipse it just gets dark & air temperature remains the same, hence water vapor is the controlling factor; NOT CO2…. QED. Observe the absorption spectra of GHGs and the emissions spectra of the Earth. Unless you can change the laws of physics, that is your evidence that CO2 is NOT the main green house gas. 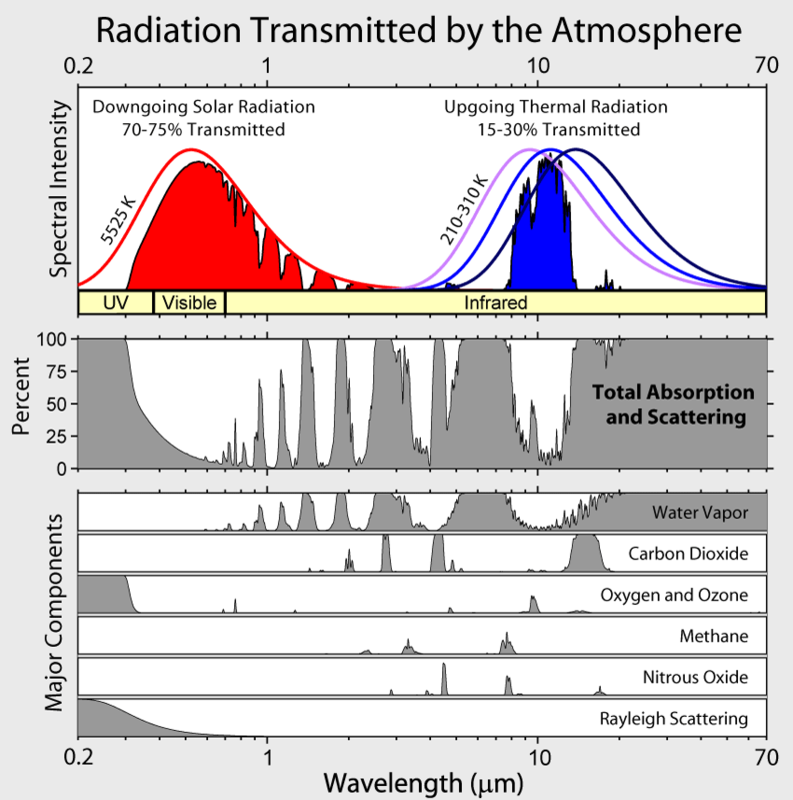 Note how water (H20) absorbs most radiation particularly in the infra-red; CO2 has 4 small spikes. Planck’s Law states, “Net energy transfer occurs from high to low”. Thus, when one looks at the data it is clear that the surface stations are warming first, followed at a lower rate by the atmosphere (read by satellites). 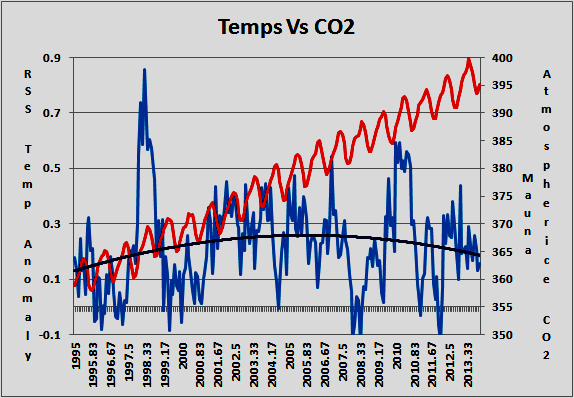 This means that the warming CANNOT be due to CO2. This of course does not mean that a warming is not happening. It simply means that CO2 and back radiation cannot be the cause. Rather, the cause must be something that is allowing MORE radiation from the sun to reach the surface from the sun. Climate Scientist Professor Murry Salby’s Excellent clear lecture on CO2 & global temperatures explains why scientifically…. 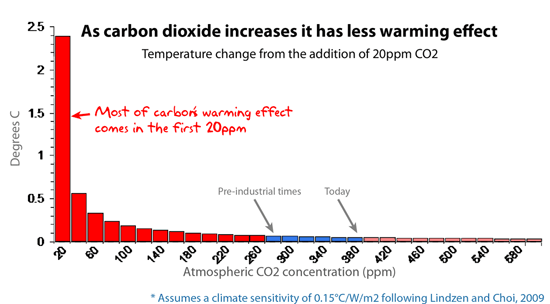 The atmospheric CO2 CANNOT be the source of the warming, because it lags the surface temperature. https://www.youtube.com/watch?v=HeCqcKYj9Oc 2014. 67 mins Starts at 2 mins don’t worry about the equations in the first 25 mins (they are only if you want to run a check on his math’s) listen to the words !! So what happened since 1999 ?? 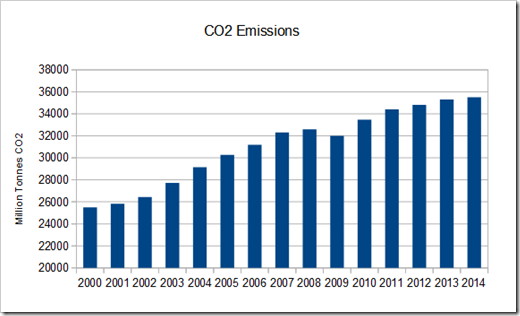 Total CO2 has gone up…but…temperature & climate has remained stable.